MEMS-Sensors (Micro Electro Mechanical Systems) for mobility solutions. Every car nowadays makes use of semiconductors, and that has been true for quite a while. A key technology in today’s modern world, these chips are core components of electrical systems – including those in vehicles. They regulate the powertrain and vehicle handling, tell the navigational system which way the vehicle is going, and signal the airbag to deploy when needed. Bosch has been making semiconductors for more than 45 years and at present is one of the leading manufacturers of chips for mobility applications worldwide. “Semiconductors may have been around for a long time, but we have yet to realise their full potential. These components are key to modern-day mobility, and it is impossible to imagine cars today without them,” said, Jens Fabrowsky, member of the executive management of Bosch’s Automotive Electronics division. The company claims that in 2016, every vehicle newly registered worldwide had an average of more than nine Bosch chips on board. “When it comes to semiconductors for cars, we have a singular advantage: Bosch is the only company equally at home in both the automotive and semiconductor industries,” added Fabrowsky. In 2018, every new vehicle featured semiconductors worth $370 dollars (Rs 27,026) (source: ZVEI), and thanks to increasing electrification and automation the demand for chips in vehicles is expected to rise further over the next few years. The global semiconductor market is worth billions, and according to the market research company Gartner global semiconductor sales is expected to reach $ 451 billion (Rs 3,291,849 crore) in 2018. By 2019 alone, the market will have grown at an annual growth rate of more than 5 percent (source: PwC). In the semiconductor market, the ultimate discipline is making chips for vehicles, and Bosch says it has been making vehicles smart since the 1970s, when it started equipping them with its application-specific integrated circuits (ASICs). In a vehicle, the chips are exposed to strong vibrations and extreme temperatures that range from far below zero to far above 100 degrees Celsius. This require higher standards for the toughness of these special components. Developing semiconductors that can withstand these stresses for a vehicle’s entire lifetime is an intensive process. Bosch says it leverages its special dual role: while other companies can process the information collected from semiconductors, the company says it can also apply its deep understanding of the physical principles at work in the chips, and of how to gather the data and ultimately integrate it into the vehicle systems. Fabrowsky, comments “Our comprehensive expertise in semiconductors helps us to both develop new automotive functions and steadily improve the chips themselves. Bosch holds over 1,500 patents and patent applications for engineering and manufacturing its semiconductors. Bosch’s current semiconductor portfolio focuses on microelectromechanical systems (MEMS), ASICs for vehicle ECUs, and power semiconductors, which it say without the latter offering, there would be no hybrid or electric vehicles. As they regulate the electric motor and make sure that the battery is being used as efficiently as possible. “Power electronics for hybrid and electric vehicles are a growth driver for Bosch,” said Fabrowsky. Besides electrification, continued strong growth in demand for driver assistance systems is ensuring that more semiconductors with more and more functions are finding their way into cars. Chips with built-in 'intelligence,' known as ASICs, are tailored to a particular application. For instance, signalling the airbags in a vehicle when they should deploy. These chips control handling to ensure a consistently safe journey. They also boost the measured signal from radar sensors, so that the proximity warning always functions reliably. “Progress in microelectronics is what made development of assistance systems and automated driving possible in the first place,” commented Fabrowsky. Bosch says its microelectromechanical systems (MEMS) are the sensory organs of the modern vehicles. They supply a vehicle’s ECUs with important information regarding its handling, such as if the vehicle is braking or accelerating, or if it is skidding on a smooth road surface. The ESP electronic stability program uses this information to keeps cars, trucks, and even motorcycles safely on track and in their lanes. As a key technology for the internet of things (IoT), Bosch semiconductors have applications that extend far beyond the world of vehicles. The company’s sensors can be found in more than half the world’s smartphones, and are indispensable for fitness trackers, drones, game consoles, and smart home applications. When it comes to MEMS sensors, Bosch says it continues to be a pioneer and the world’s leading manufacturer. More than 20 years ago, the supplier of technology and services itself developed the microfabrication technique, known worldwide as the “Bosch process,” used to make these semiconductors. The technology major is underpinning its growth strategy for semiconductors with the single largest investment in the company’s history. Bosch is investing around 1 billion euro (Rs 8,314 crore) for a new wafer fab in Dresden, which is scheduled to start manufacturing 300mm wafers starting in 2021. The company says in compare to conventional 150- and 200-mm wafers, the 300mm wafer technology offers greater economies of scale. The company states that around 700 associates will be involved in the highly automated chip manufacturing process, working to plan, manage, and monitor production. 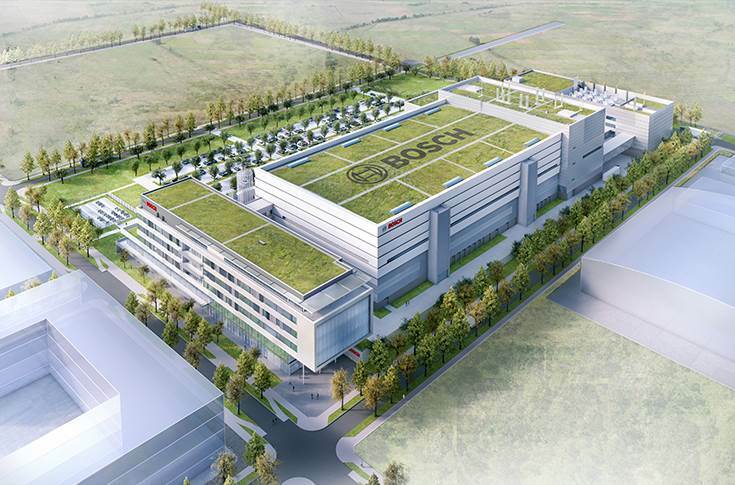 After Reutlingen, the Dresden plant will be Bosch’s second wafer fab in Germany. With it, the company aims to expand its manufacturing capacity, and thus to further boost its competitive edge in global markets.